Today I was inspired by a post that Joanna from Work in Colour wrote. Joanna writes about ways to approach a particularly sticky problem. This sparked my interest, as this is often where those of us who’ve had shopping problems end up: with a sticky problem we need a solution to. The idea is that when you have a problem, you use a strategy that other successful people have used (including Leonardi Da Vinci – the most pedalstilised of creative genius). And that strategy is this: come up with 100 ideas on how you could approach the problem. Come up with 100 questions, or 100 possible solutions (however outlandish) or 100 actions you could take (however undoable some of them may be). I love this idea! The idea of 100 ideas is to go “blue sky” in your thinking. To not limit yourself with unnecessary practicalities, like will this actually work? No – that comes later. Before you get to Will this actually work? you need to open the parameters of your thinking, and collapse the walls of your limiting beliefs. If you start too soon with the limiting practicalities, the creative ideas never get a chance to get off the ground. You need to bounce around in the world of possibilities first – pretending there are no limitations. Then once you have exhausted all those free-wheelin’ creative possibilities, you introduce the practical realities and see what can be put into action in the real world. This is a process that really works. When I was a corporate facilitator working with leaders and high performing teams for huge global firms, this is one of the processes we would use. It’s often called the Disney Model. 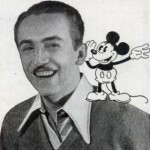 Walt Disney may not be Leonardi Da Vinci, but there’s no denying the impact that Disney had on the world we now live in. His creative genius may be of a more contemporary nature, but a creative genius he was. So, if this approach worked for ole Walt, it can work for us garden variety shopaholics, right? 100 ways you can make your own Year Without Clothes Shopping journey easier (for those of you already doing the program), or more fun, or lighter.